When Cook County Illinois hosted a German metal manufacturing delegation, they asked Catalyze about possible locally made products as mementos for the delegates. Catalyze, having been part of the DesignHouse REVEAL frame story from the beginning knew the exact fit: a locally designed and manufactured metal frame for the German metal manufacturing executives. What to put in the frame? Irene Sherr of Cook County fastened the perfect local/global combo -- a photo of Brandenburg products in the Chicago metal frame. Partnerships on display. Thank you Catalyze and Irene for putting it all together. Supporting local manufacturing, living local (like the farm-to-table movement), and going green!" Morgan's project originated in an architectural felting class where their only prompt was to create something modular. "When we were throwing out a range of ideas I actually had a flashback to Big Delicious Planet. I was really inspired by their backyard garden and fresh picked herbs growing vertically on fences everywhere." In Blacksburg, Virginia, home of VaTech, the local farmer's market is very popular and, as a team, they wanted to highlight local, green living by bringing plants into people's homes. Their manufacturer is only 45 minutes from campus in Roanoke, called Cardinal Rubber. Everything is sourced from the U.S. and will be made in the U.S. The local papers have picked up the story. Way to go Morgan and Team! And thank you for carrying the DesignHouse mission forward. Support Local! They are almost at their goal. "StartupBus is a three-day tech challenge road trip. Buses made up of hackers (engineers), hipsters (designers), and hustlers (business gurus) begin from all over the country. The destination is Nashville. The goal is to come up with and build a working prototype for a viable startup product." The June bus was StartupBusMAKE - the first and only hardware bus. And one of the Chicago teams was highlighted in the awards. Included here are blogs from two of the participants. Mika Ichiki-Welches, a summer intern at Catalyze, wrote this lively blog about her experience on the StartupBus. And Jeanine Blaire, one of Mika's team member posted this. Chris Bue was instrumental in getting the Chicago team and their success "on the road". London Calling -Paul Hatch brings 'local' abroad. The annual PD&I conference in London congregates some of the UK's best designers for a two days of talks and discussions on current and future trends in industrial design, production and technology. I was invited to talk about Design House, TEAMS and the 'Design For Local' movement. Similar to my talk in Florida, I explained the rise of the 'local' movement by threading together ongoing trends and unmet needs. PD&I gathers many of the leaders in UK design. I grew up in England, but have lived in the US since 1998 so I was intrigued to see how relevant the topic of supporting local manufacturing was in the UK. Manufacturing went into a steep decline there in the eighties, long before similar shifts happened in the US. Like in the US, the government used patriotism to defend manufacturing, with "Buy British" campaigns and awareness about products made in the UK. What I found is, like in the US the term 'local' has a lot more value to consumers and could also become meaningful banner to rally under. We discussed strategies to approach Design For Local, in which we can make local manufacturing have an inherent edge over imports. I was glad to find that the attractiveness to support local is as relevant in the UK as it is in the US. Paul Hatch was invited to talk about 'Design For Local' at the 2015 IDSA Southern District IDSA Conference. The industrial designer audience was no stranger to Paul's design firm TEAMS Design, but the subject matter of using new strategies to design for local manufacture was new. Paul Hatch explaining Design For Local strategies at 2015 IDSA district conference. His presentation started with identifying key ongoing trends such as farm-to-table, the maker movement and the democratization of marketing and production. He threaded these together and pointed to a new opportunity for us to revitalize local manufacturing. "As designers we find ourselves in a unique space and time. We have the ability to make a huge difference but only if we seize this opportunity right now". He showed how global design firms such as IDEO and TEAMS use strategy to improve user experience through design and add intangible value to objects through design. These methods can be used on a local scale, and combined with product strategies involving time-to-market and customisability, we can give the advantage back to the smaller, local producer. In March of 2015, while still at DesignHouse, Pam Daniels was invited by the International Housewares Association to talk about Design House and the ongoing trends Design House is part of. Her talk was at the International Home and Housewares Show, the US's largest annual trade show for household products and trends. Pam started the presentation explaining the Design House process, presented using the case study of the REVEAL frame (with Skol Mfg). The Q&A and discussion that followed wasinteresting, and DesignHouse made new connections with some firms that are actively supporting local manufacture in different ways. Through our connections with hardware accelerator Catalyze Chicago, we were invited to 'pitch' at Technori on a cold February evening. We chose to explain the Design House process and provide an example story to demonstrate how we go through manufacture research, the jam, prototyping and eventual launch. The challenge of the 'pitch' was to deliver the presentation in exactly 5 minutes, which calls for trimming the information down to the most important elements . Pam gave a great presentation and seemed very relaxed in her delivery despite the jam-packed audience of over 250 people. Paul Hatch joined her for the Q&A, and the topics were geared mostly towards the business and structure of Design House and less about the process or missions. The theme of the Technori evening was about startups and the Maker movement, so the audience was interested in the business model behind Design House and how it can function as a not-for-profit. Last night, around 40 creatives gathered at Catalyze Chicago around beer and delicious Italian food to develop designs around local manufacturer, Universal Electric Foundry. The foundry is a local sand-caster located on Ashland and Hubbard. Because this was the third DesignHouse jam, many attendees were already familiar with the DesignHouse method. Paul and Pam, DesignHouse founders, led the night off with a quick overview of DesignHouse and its mission. Then, students presented the manufacturing video to give the attendees a clearer idea of who Universal Electric is and why they need our help. They are a family run business, over 100 years old, 4th generation, and they have watched their quantities slowly decline and now all is quiet. The students visited them for a tour at the beginning of the semester, and when they tried to go back to film some more footage, there was nothing to film because there was no business. This is exactly what DesignHouse aims to fix. #SAVETHEFOUNDRY ! Once the designers were inspired and understood their materials, we introduced four "buckets", or categories, to direct designs: small household items (smaller than a breadbox), urban objects (for public spaces), furniture (for Crate&Barrel), and the last bucket was anyone who wanted to further ideate on ideas from Jam001. Designers broke into groups and began sketching rapidly, ideas building upon one another, and all ideas welcomed. No one was afraid to sketch or model (although the modeling clay was cold and a bit hard to work with). Thank you to Catalyze Chicago for their wonderful hospitality! We are very gracious that we were allowed to use their space on such short notice! Yesterday we launched our first Kickstarter! REVEAL is doing pretty well, sitting at around $5000 and 70 backers after one day. We have been featured in design blogs and the news and we ask that you spread the word to your friends and family as well. We need to spread the message to #supportlocal like wild fire! Thanks for all the generous support! 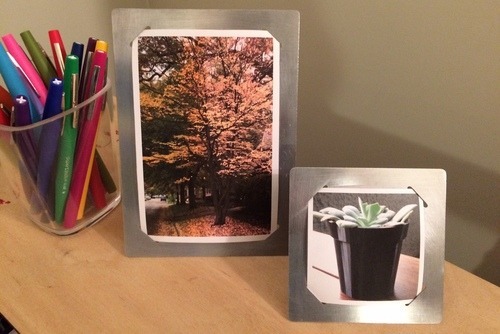 We centered on one product today: a simple new take on a photo frame. The concept was inspired by a few forms which emerged in Tuesday’s ideation session, visible on the left below. The first metal prototype is on the right. 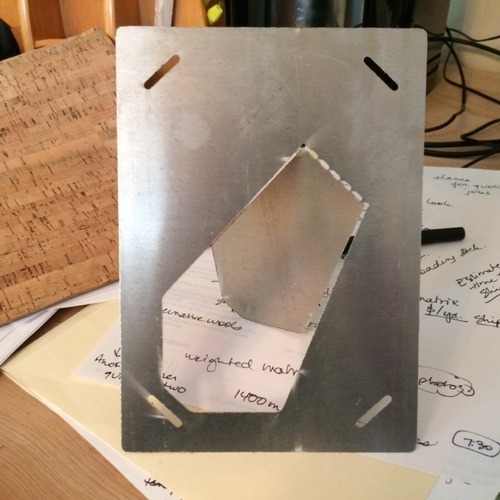 Simple flat metal frame; consumer bends it at perforation to stand. Will either be produced in powder-coated steel or anodized aluminum. This is unfinished 0.038 inch aluminum. The object is a simple flat-pack frame that consumers fold out after purchase. Photos no longer require the protection of glass since the real artifact is digital. We just print copies; the framed photo is no longer the one & only version. If coffee spills on it, we shrug it off and print another. With this design, we echo the corner mounts of old but keep the form super simple without any glass front. A new age calls for a much simpler form. Today’s energies were spent creating files for a range of sizes expanding the initial 4x6 inch photo option to 5x7 and a 3x3 square. We also began to think about finishes and materials. We gave the prototypes a quick rub with steel wool and it dresses them up nicely. Late in the day, files were sent to SKOL Manufacturing for a manufacturability review and initial price estimates. There are still decisions to be made on finishes and any minor refinements required to make this manufacturable on a turret press (corner radiuses, tolerances on the small perforations, etc.). But it’s looking like we actually pulled this off. We went from concept to product in just one week. Today, CAD file creation and rapid prototyping continue on a range of concepts. We have a few photo frame options in the works, a colander for washing fruits & veggies, an rectilinear kitchen bowl, and a cylindrical wall sconce all being explored. We kept playing around with design refinements in cardstock yesterday, thinking about how things would fit together and what obstacles might make fabrication a challenge. 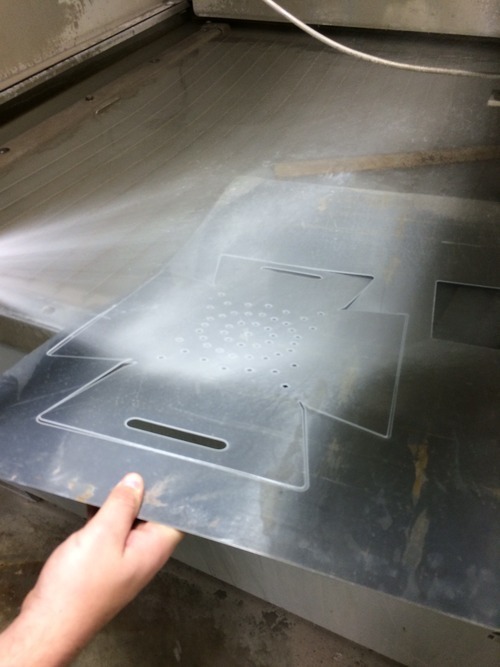 Today the focus is on creating a digital file which can be sent to a laser jet or water cutter to see how the designs will play out in metal. 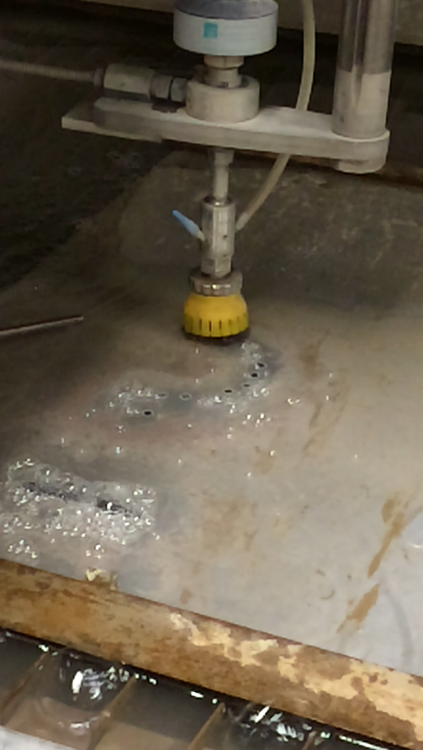 Ultimately, we will use a turret press and brake press to punch and bend the sheet metal to form our objects, but in the early stages it’s about proof of concept, not the most economical ultimate production method. Initial results are promising. 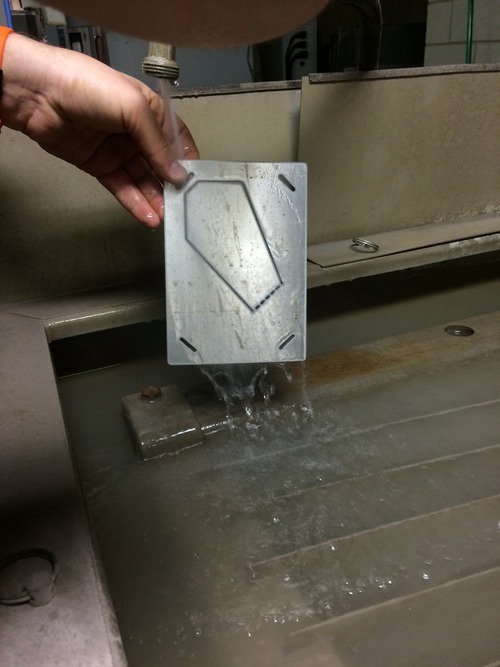 Photos show a water jet at work cutting out the first few designs. We are cautiously optimistic that at least one of these concepts will work. But we have enough experience to know that a few challenges likely lie ahead. Onward! DesignHouse hosted a lab during Chicago Ideas Week, inviting the public to join us for a hands-on ideation session as we attempt to go from concept to product in just one week. On Tuesday morning, participants gathered at Catalyze Chicago to sketch, model, and brainstorm ideas during a two-hour mini design jam. Throughout the week, DesignHouse staff & students are filtering through and developing a few promising concepts which can be fabricated locally. The aim is to have a working prototype by Saturday night’s CIW talk on the creative process. Our local manufacturing partner is SKOL Manufacturing, a metal fabricator in the Ravenswood corridor on Chicago’s north side. Special thanks to Ray Skol for being available to answer any questions about the metal fabrication process and to Mike Slezak of Jane Addams Resource Corp for introducing us. Tuesday’s work involved more paper mockups, some thoughtful questions about which design lent themselves best to metal, and sorting out what seems doable to actually build in the next few days. Next step: prootyping in metal. Stay tuned! Design Jam 001 took place on June 26, 2014 and was held at TEAMS Design, an industrial design firm located in the Kinzie Industrial Corridor. Our kickoff event drew a talented bunch of about 40 participants from across Chicagoland. After dinner and a bit of socializing, we gathered to learn about SKOL Manufacturing, a metal fabricator and job shop located in the Ravenswood corridor with capabilities ranging from bending & brake pressing to cutting, welding, and stamping. Then we broke into ideation groups centered on three areas: lighting concepts, outdoor gardens, or Chicago-themed. Over ninety different sketches emerged within an hour and a half. We had an opportunity to come back together at the end of the night and share back what was imagined and get each others’ take on what resonated most. The inaugural design jam received press covereage from the Chicago Tribune and has also been featured on the TEAMS Design blog. We are grateful to all our participants, whose names are listed below. It’s exciting to be at the start of this journey together.